(Turner Brigade Website) The Woodruff Gun, invented by James Woodruff in 1861, was a light piece designed for service with the infantry and cavalry. 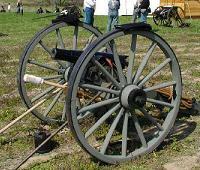 It had a steel barrel with a 2 1/8 inch bore, and was mounted on a reduced-size carriage. It could readily be moved around by just two men. The Woodruff Gun, which was initially rejected several times by the War Department, was eventually purchased in small numbers. Woodruff Guns served at various stations and with various units in the Western theatre throughout the war. In design and function, the Woodruff Gun was similar to the Mountain Howitzer. Margreiter, John R. "The Woodruff Gun" Civil War Times Illustrated, May, 1973, ed. Image Note: I am informed by Randy Baehr of Company M 1st Missouri Light Artillery (reenactment group, Turner Brigade) that their carriage is not authentic due to the lack of original specifications from which to work. Mr. Baehr does, however, state that the 48 in. wheel height is correct per original specifications.